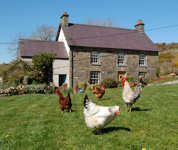 Bed and breakfast farmhouse accommodation and organic farm shop at Nantgwynfaen our working organic farm, in West Wales. In our farmhouse we serve organic local produce to our bed and breakfast visitors, including our own free-range eggs, own recipe sausages, dry cured bacon, homemade bread and marmalade, with local dairy produce. With crisp white cotton sheets, and freshly squeezed juice it will be your favourite bed and breakfast in Wales. We have an extensive bi-lingual breakfast menu with some local Welsh favourites. Nantwgynfaen, certified by the Soil Association, is run in accordance with organic standards. We keep poultry, sometimes pigs, and rent the land organic farmers, Tom, Eva & Philip Cowcher who graze Welsh Black cattle, and sheep. As well as running our bed and breakfast, an organic farm shop, and making bespoke furniture, we also grow our own vegetables. Visitors are welcome to walk the farm - there are orchards, streams, amazing hedgerows and wildlife - don’t miss the bluebells in May. Buzzards and Red Kite fly over the farmhouse and swallows swoop over the yard in summer – you can enjoy bird watching even from the B&B window! It is a very peaceful place, and our traditional stone and slate farmhouse (built in 1840) provides relaxing and comfortable holiday accommodation. Ideally suited for couples and families, there is something for everyone here – so don’t forget your wellies! Our bed and breakfast is located centrally between Carmarthen, Aberystwyth and Cardigan and provides an ideal base from which to explore the local area. Close to Llandysul, Newcastle Emlyn, Aberaeron, Lampeter and the beautiful Cardigan Bay Coast famous for dolphins, seals, puffins and spectacular scenery. It’s cliff top walks and coastal paths provide excellent walking holidays. Sea kayak or canoe in the rivers, fish the Teifi River, one of the richest rivers in Europe for trout and salmon, or go sea fishing from New Quay – it is an angling paradise. Is it fresh sea bass, crab, lobster or mackerel for dinner? Visit ancient Welsh castles, absorb the history and culture, have a cycling holiday, or simply relax on a sandy beach. With a wealth of local produce there are many excellent places to enjoy the local food of West Wales – that is if you have any room after your breakfast! You can of course have a candle lit dinner by the log burner in our cosy farmhouse accommodation. We place great emphasis on simply cooked fresh local food – real home cooking. We can cater for special diets and foodies alike. We prepare picnics, and children’s meals, we have set menus or you can tell us what you like. Most of all, we want you to enjoy your stay at our bed and breakfast and for it to be memorable too. You are welcome to wonder around the farm, to browse in the organic farm shop, and view the bespoke furniture being manufactured in the workshops. The farmhouse is full of our handmade furniture – you can even sleep on it! We look forward to welcoming you to our farm, Croeso! Visit us.